Cet article s’appuie sur une analyse de la morphologie urbaine de la ville à partir des cartes de Damas dressées au cours du Mandat français. Il a pour but l’étude du processus de fabrique urbaine de la période médiévale sur les traces de la cité préislamique – jusqu’à la période ottomane, en portant une attention plus particulière aux cours des maisons damascènes. Il ne s’agit pas ici de donner une description exhaustive de toutes les étapes et de tous les processus de formation de la Damas ottomane mais plutôt de fournir une analyse de la ville intra muros, de loin la plus complexe étant donné la stratigraphie accumulée au cours de l’histoire, en essayant de décrire les principales transformations qui ont présidé à la mise en place de la structure de la ville ottomane. This study is based on an interpretation of Damascus urban morphology based on French cadastral maps. It focuses on the processes of urban fabric from medieval times (on the remains of the pre-Islamic city) to the Ottoman period, paying particular attention to the processes of formation of courtyard houses and their role in the urban fabric. 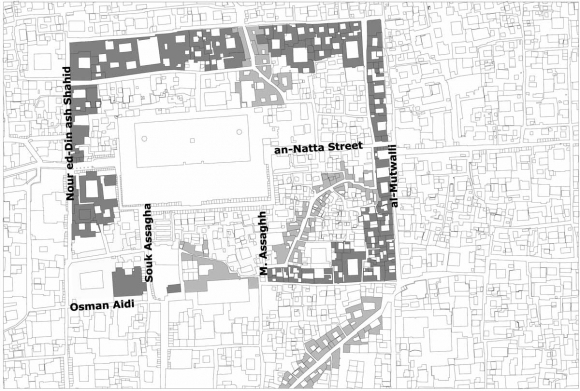 The aim of this study is not to give an extensive description of all the stages and formation processes of Ottoman Damascus; but rather to analyze the most complex urban areas within the walls. It is also an attempt to describe most important transformation processes that were at the origin of the Ottoman urban structure. تستند هذه المقالة على تحليل الشكلانية العمرانية لدمشق انطلاقاً من خرائط للمدينة تمّ إعدادها أثناء الانتداب الفرنسي. وتهدف إلى دراسة السيرورة التدريجية للصناعة العمرانية خلال العصر الوسيط – متتبعين أثر المدينة ما قبل الإسلام – وحتى العصر العثماني، وذلك بمنح اهتمام أكبر بباحات البيوت الدمشقية. وليس المقصود هنا إعطاء وصف متكامل لكل المراحل ولكل أنواع السيرورة في تشكيل دمشق العثمانية، إنما المقصود بالأحرى تقديم تحليل للمدينة داخل السور، وهو الأكثر تعقيداً بسبب الطبقات التي تراكمت على مرّ التاريخ، محاولين وصف التحولات الرئيسية التي كانت في مقدمة إرساء بنية المدينة العثمانية. 1French cadastral maps give us a detailed description of the Damascene urban fabric at the end of the Ottoman era, just before the major changes that affected the city in modern times. As such, they represent a useful tool for the understanding of the processes of formation of the urban landscape through processual typology. This method is based on the hypothesis that the history of a town is written within its built fabric and that it is thus possible to trace the different phases of anthropic organization of a city in the structure of its urban fabric. Because of the fact that in Damascus the different phases of anthropic organization came about gradually, it is possible to use such a methodology to interpret for instance the process of formation of the Ottoman courtyard house. 2Studies on this city have so far mainly focused on the history of its public monuments and not on the processes of formation of the urban fabric‑and in particular on the structure of the aggregates and of the building layout. The aim of this work is to reconstruct the different phases shaping the urban landscape of Damascus from the Medieval to the Ottoman period, paying particular attention to the processes of formation of the courtyard houses. This essay hence represents an attempt to fill a void of interest on this topic. 3The reading method adopted to retrace the different phases of construction underlying of Damascus courtyard houses is based on the notions of process typology and the hypothesis that the history of a city‑and the processes behind its current layout‑is readable within its fabric. The aim of this study is not to give an extensive description of all the stages and formation processes of Ottoman Damascus but rather to give a sample. It analyzes the medina urban areas of the city within the walls that has a greater complexity and stratification over time, trying to describe their most important transformation processes and the origin of the Ottoman urban structure. 5The analysis has been carried out as a historical, temporal and spatial investigation of the morpho-typological process that determined the Ottoman formal of the built-up areas and the courtyard residential buildings within the medina; a methodology of urban studies developed in Italy since the 1960s by S. Muratori and his school.3 This methodology of interpretation of urban structures is based on the hypothesis that the history of a town is “written” within its build fabric and that every urban structure is inseparable from that of the territorial organism within which it is situated (depending both on the natural form of the places and on the elements of the anthropized territory in the phases preceding the considered ones). According to this approach, the traces of the different phases of human organization of an urban or territorial entity can be read in the structure itself. This method is based on a comparison between the orthogonal alignments of the building fabric and the size of building blocks to that of the spontaneous routes. The town is then analyzed through a divison into horizontal sections while the fabrics are divided on the basis of their different development phases to identify the occurance of superimposition and influence (whose boundaries are not visible today), which have determined their shape and structure. The reading of the orthogonal alignments of the fabric corresponds to the traces of the different phases of critical (planned) anthropic organization of the urban or territorial organism. Such traces are not necessarily represented by archaeological remains, but can consist of property boundaries, routes, rows of trees or canals in the rural areas, and, in the urban context, the traces of preserved ancient plots; new walls built on pre-existing foundations or along the original plot boundaries. The measurement of the rhythm of such remains (adapting to the units of measurement used in the various epochs) is a reference for the attribution of every single phase to a certain historical period. The spontaneous routes (curvilinear or crosswise) correspond, instead, to the phases of expansion that were not coordinated by a central organism. It could indicate that a portion of an urban territory was organised by homogeneous groups of dwellers, phases of extension along territorial routes, spontaneous phases of development subsequent to urban planning which, if read in relation to the planning projects themselves, help in delimiting their width. 6The specificities of the urban morphology (continuity of routes; convergence of routes towards urban nodes such as gates and religious buildings; regularity of the urban fabric and recurring building orientation; presence of building complexes or housing in the areas around public buildings denoting a synchronic edification; remains of ancient walls; presence of cemeteries defining stages of expansion; gap paths signalling the presence of obstacles or limits) that makes the behaviours typical of fabrics and types, allows us to consider the process of transformation of the urban landscape in time as an organic development, whose reconstruction can be useful to provide instructions for researches and activities involving the urban landscape. 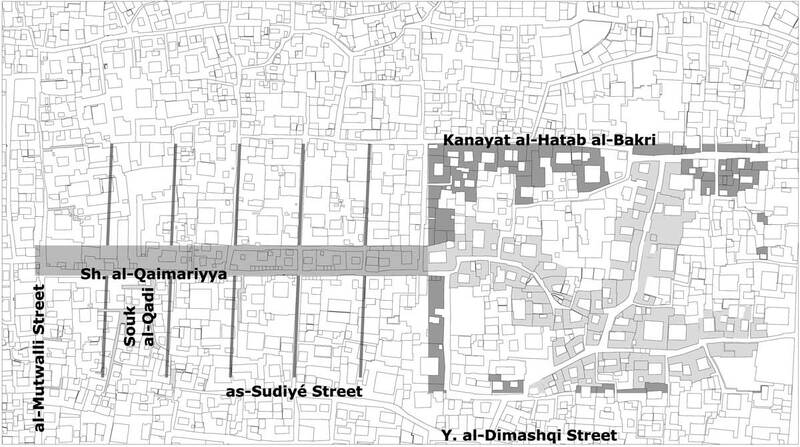 7Due to the lack of historical information on courtyard houses and to the fact that it is impossible to carry out extensive surveys of the urban territory, it was necessary to apply this method of interpretation for the morphological data of the urban structure of Damascus walled city. The method has furthermore allowed us to compensate for the lack of archaeological data on the early-Islamic and Medieval structure of the town and to integrate the existing sectorial and discontinuous data on the city’s history in these phases. 4 «Ville de Damas», C. Durrafourd et al., 1:500 scale, 1926. 5 See Behrens Abouseif 1993. 9The structural complexity of the architectural and urban heritage of Damascus is the result of at least two millennia of progressive conformation and stratification. Its development model may be thought of as a palimpsest, in which the successive overlapping of signs has determined a linear evolution of urban forms. 10As in many other Syrian cities, the urban fabric of Damascus reveals continuity from the Hellenistic-Roman to the Islamic city, via the Byzantine city; i.e. Medieval Damascus conserves classical antique urban features in its current urban structure. 11The main problem faced by historians and archaeologists is to differentiate between the phases of urban development in the pre-islamic periods; Hellenistic, Roman and Byzantine, given the mutual influence and overlapping. Such cultural interaction has led to the reproduction of similar architectonic and urban forms all through the eight centuries of the Hellenistic-Roman civilization. 7 See Wulzinger & Watzinger 1921. 8 See Sauvaget 1934; Sauvaget 1949; Élisséeff 1980. 12The most reliable studies on the city have presented, indeed, partly conflicting hypotheses on the origin of its urban form: while the German archaeologists Carl Watzinger and Karl Wulzinger have reconstructed the Roman layout,7 the French historian Jean Sauvaget described the urban layout during the Seleucid era,8 attributing to the Romans only the adjustments (the construction of the temple, of the colonnaded street, and of regular city walls) and not of the bi-axial urban structure with the central forum as did the Watzinger and Wulzinger.9 Both studies, however, present a regular plan of the city, inscribed in an almost rectangular area surrounded by regular walls in the range of 105-135 hectares and crossed from west to east by a colonnaded street.10 They also highlighted three main phases of urban development. In the Hellenistic period with the foundation of the city, to the east of the ancient Aramaic city, the a regular size of blocks was of 45 × 100 meters. It was during this period that the city walls were built, perhaps also the reconstruction of the royal palace, water channels, the construction of the theatre and housing development was similar to that of other Seleucid cities. In the beginning of the first century AD a new Nabataean neighbourhood was founded outside the walls of the Seleucid city. This area corresponds to the routes and urban fabric that can be read in the western part of the city. When the walls were torn down, the shape of the wall that separated the Hellenistic settlement from the Nabataean one became a transverse axis of the city (Bāb Tūmā Street). Finally under the Romans there was a profound urban restructuration, characterized by the transformation of the Via Recta, the construction of the temple, the restructuration of the road that connected the agora to the temple and the construction or improvement of the hydraulic works. 11 See Sack 1985; Sack 1989. 13The reconstruction of the historical urban structure of Damascus made by the German archaeologist Dorothée Sack11 take into account the assumptions of these three scholars. All these studies reconstructed the form of the city at its apogee, as modified in the Roman or Late Antique period, which constituted the substratum of the Islamic city. Indeed, the classical organisation of Syrian cities and territory remained unaltered for a long time and represented the basic model in the region, even after the fall of the Roman Empire, since it offered an ideal support for the new functions introduced in the Islamic city. 14It is rather difficult to describe the specificities of Damascus at the end of the Umayyad period, since its urban form derives from a combination of different architectural traditions and settlement models.12 In the urban landscape of Old Damascus is still possible to distinguish the different strata of the pre-Islamic and Medieval Islamic city, preserved in the stone building fabric and that constituted the basis of the Ottoman city layout. 15The analysis of the urban fabric of the intramural city‑based on the French land registers of the 1930s and using the tool of the process typology‑can test and enrich the hypotheses formulated by archaeologists and historians who have worked on Damascus pre-Islamic and early-Islamic urban fabric. It shows that the urban fabric of the old city consists of different substrate structures, which have resulted in the development of the different building types and fabrics of the Medieval city. In particular, it shows that the urban fabric that are at the basis of the physical structure of the Ottoman Damascus started their formation in the Umayyad times and were consolidated in the Middle Ages. 16In this section I will try to sample some aggregates of buildings, chosen because they are representative of different substrate forms and structures of the old city, which gave birth to the complexity and richness of the Ottoman urban fabric. Of these the substrates structures whose transformation and densification in the Middle Ages led to the development of the Ottoman city will be analyzed . 17The first underlying structure, which has influenced the formation of Medieval and then Ottoman Damascus, was the Hellenistic agora and the residential building blocks to its west, traces of which can be read in the urban fabric of the Qaimariyya13 neighborhood. It is shaped by two series of four rectangular blocks of about 45 × 75 meters, and whose structure is characterized by a regular aggregation of courtyard houses developed in continuity with the substrate Hellenistic building fabric. Here the current extension of lots of courtyard houses is quite large. It results from the process of recasting and medievalization of the Hellenistic lots (which occupied half the width of the original blocks) and varies between 16 and 23 meters in depth, in some cases reaching the dimension of 28 × 38 meters14. 18Given the small depth of the Hellenistic blocks, one hardly ever finds culs-de-sac: planned building routes orthogonal to Qaimariyya Street where access to houses is direct15. Only in the southwestern blocks of the district, between as-Sudiyé Street, al-Mutawalli Street and Souk al-Qadi) there is a more widespread presence of dead-end routes. These are the aggregates which are rotated of approximately 14 degrees to the north-east/south-west, an orientation that prooves a later formation, which is tied to a more spontaneous (unplanned) logic of urban development than that of the Helleno-Roman period. 16 See Sauvaget 1934; Sauvaget 1949; Élisséeff 1980. 19Qaimariyya Street, which is 284 meters long and about 23 meters wide, still today clearly demonstrates a Roman restructuration of the Hellenistic street layout. Due to the presence of a route parallel to the Qaimariyya street, between the first three series of eastern blocks, and of an increase in the depth of the blocks in the three western blocks north of the Qaimariyya Street‑which reach a maximum depth of about 100 meters. It is likely, indeed, as suggested by Sauvaget, that the Hellenistic blocks had the size of 45 × 100 meters, and that the Roman restructuration resulted in the widening of the Hellenistic Via Recta (Qaimariyya Street) from about 6 to 23 feet with its transformation into Strata Colonnata.16 The fact that the ten blocks we are dealing with and the Qaimariyya street are not orthogonal to each other is another indicator that they are non-contemporaneous. 17 As, for example, it happened at Laodicea, Aleppo and Palmyra. 20The present state of the Qaimariyya Street originates in a medievalization, started in the Byzantine period. Unlike what happened to the colonnaded streets of many other Syrian cities, here the space between the columns was only filled with commercial constructions in very few cases17. The peripheral location of this route in respect to the political and commercial centre of the Medieval city, the area around the Great Mosque, meant that in Medieval times the road space here was rather occupied by residential than commercial buildings. Indeed, the size of the houses on the Qaimariyya Street is significally smaller (12 × 17 meters) than the courtyard houses of the blocks along the same street derived from the transformation of the Hellenistic urban fabric, as conditioned by the width of the Roman road. 21The eastern boundary of the Qaimariyya Street, which was identified by Sauvaget as the Hellenistic agora, is an almost rectangular area of 254 × 186 meters bounded to the west by Bab Touma Street, to the south by Y. al-Dimashqi Street, to the north by Kanayet al-Hatab al-Bakri, and to the west by al-Kaneesè Street. The urban fabric inside these boundaries, in the courtyard of the agora, is of Medieval origin. This is proved by the aggregate of buildings along the boundaries of the area that have the same orientation as the Hellenistic urban fabric, and a series of diagonal routes (such as al-Manqalani ad-Dawamneh Street and Ash-Sh. Ghazal), which connected the access gates to the agora when (after Byzantine times) its original function had been abandoned and people started to build houses inside it. Residential buildings of small dimension mainly constitute the urban fabric along these spontaneous crosswise routes. Big courtyard houses are located in the interstices between the diagonal routes and the limits of the rectangular enclosure (fig. 1). 22The urban fabric along the Straight Street represents the second trace of this first underlying structure. In the urban fabric to the north and to the south of this street (Bab Sharqi Street) it is difficult to see the continuity with this just identified building structure of Hellenistic derivation. 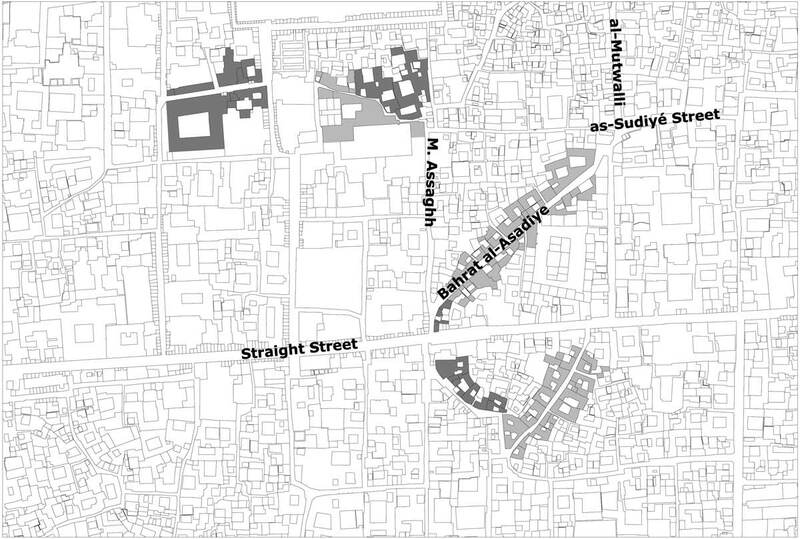 Here, although it is clear that the urban fabric has the same direction and block modules as the Hellenistic aggregates, the buildings between as-Sudiyé Street and Yassin Diab Street to the south and Zgheib Street to the north form a gap band between two areas that therefore seem to represent two different phases. The urban fabric of this area is made of residential lots whose depth reaches about 16 meters in the area between Yassin Diab and Zgheib Street, depth reaching 30 meters between as-Sudiyé Street and Zgheib Street. 23The blocks to the south of this band, to the north and to the south of the Straight Street, between Tallet al-Hijara Street to the south and as-Sudiyè and Y. al-Dimashqi Street to the north, are characterized by the presence of regular streets set in north-south direction and at a distance of about 45 meters from each other. Although the layout of these streets is quite orthogonal, the orientation in the urban fabric is not, neither to the west of the Roman Arch (despite that they are quite regular within the blocks) nor to the east of the Roman Arch where even if the streets are orthogonal to Bab Sharqi Street, the urban fabric is much less regular. In particular, north of Bab Sharqi Street, although here the urban fabric is predominantly north-south oriented, it is hard to find streets oriented in this direction and whose distance is at 45 meters. To the south of Bab Sharqi Street, however, even if in some areas the rhythm of the routes is the same of the Hellenistic urban fabric , the direction of the clusters between Mueen Madi and al-Mihrath Street is different from that of the Hellenistic layout, an example of how the Medieval urban fabric was formed, rather as a spontaneous than a planned growth. 24Finally, the building fabrics on Tallet al-Hijara Street, in the diagonal section of his route, reveal another spontaneous formation of the clusters on this street, which must have crossed an open area between three planned blocks (fig. 2). 25The second underlying structure, which has influenced the formation of Medieval and Ottoman Damascus, is that of the Nabataean city, traces of which are distinguishable in the district of Bab Touma. Here the urban structure of the Medieval and Ottoman city, whose size corresponds to modules of 45 × 100 meters, developed in continuity with the Nabataean blocks. It is interesting to note how the streets of the Qaimariyya district, oriented in a north-south direction, are not in correspondence with the others to the north and south of the Straight Street. It would seem that the blocks to the south of Bab Sharqi Street, because of their irregularity and incompleteness - were formed at a later stage than the blocks to the north. This probably attests the presence of the Hellenistic city and of the Nabataean neighbourhood to the north of the Straight Street, and a successive southern urban extension developed at a later stage, after the construction of the colonnaded street. This is made evident by the depth of the blocks immediately to the north of the Straight Street, where it is difficult to distinguish the rhythm of 100 meters units. The building fabric of the Bab Touma neighbourhood, north of the Straight Street, have a fairly regular structure. Here the medieval courtyard houses were formed by splitting the Nabataean blocks into smaller lots of about 14 meters (fig. 3). 26The third underlying structure for the formation of Medieval and Ottoman Damascus urban layout is the Roman-Byzantine city. This is a very complex structure, made of planned urban fabrics with different orientations and huge religious or public building complexes and large empty areas within the city. 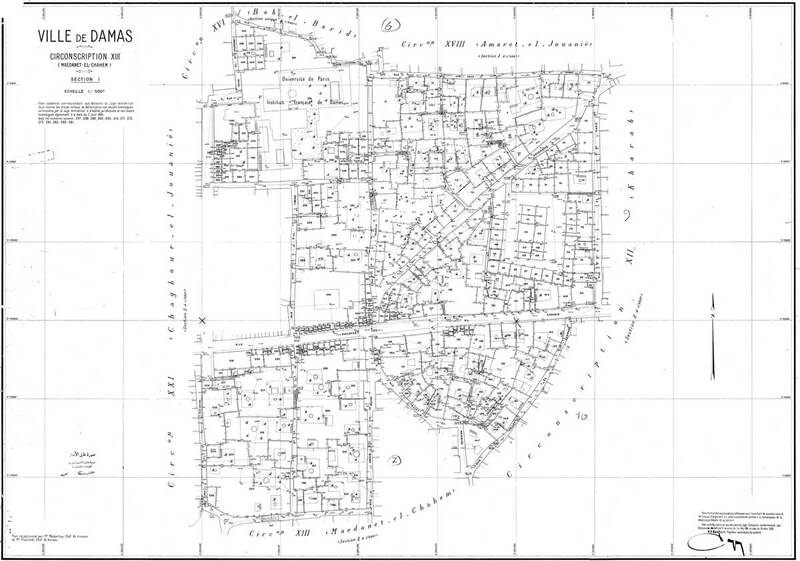 This was the basis of the complexity of the urban layout of the western quadrant of the medina. The traces of these large religious or public building complexes of the Roman-Byzantine city are readable in at least four different areas. 27The first is that of the Friday Mosque, which was built inside the temenos of the Temple of Jupiter Damascenus. Here the Roman restructuration was significant, and can be read in the traces of the large enclosure of 350 × 240 meters (dimensions which correspond to the Roman sizes of 1200 × 960 feet and to 20 heredia). The orientation of the building fabric that make up this precinct, which is bordered to the south by Osman Aidi Street, to the west by Nour ed-Din ash-Shahid Street, to the east by al-Mutwalli Street, and to the north by the Hammam al-Silsileh, differs of a few degrees from the orientation of the Hellenistic city, but it’s the same as that of al-Qaimariyya Street, showing a contemporary realization of the temple and of the colonnaded street. 28The reading of the urban fabric within the temenos allows us to speculate on the formation of the Medieval and Ottoman aggregates in this area. The distance between the Souk Assagha and Nour ed-Din ash-Shahid Street is of 71 meters (dimension which corresponds to 240 Roman feet), this probably demonstrates that the formation of these routes is attributable to the Roman times. Different is the story of the routes that – departing the first from Souk Assagha and the second from an-Natta Street – converge towards M. Assaghh Street. These two curvilinear paths that start from the temenos gates and avoid the Great Mosque, were formed after the construction of the Umayyad Mosque and correspond to people’s habit to diagonally cross the areas remained free around the mosque inside the limits of the temenos, and “codified” in Medieval times. 29The first of these two routes has influenced the formation of the Ottoman building fabrics that is the current structure of the Azem Palace. The second of these two routes has influenced the formation of the interstitial fabrics southeast of rather small size (around 8 meters on each side) that stand on the route connecting al-Natta Street to M. Assaghh Street, and which constitutes the backbone of the south-eastern quadrant of the temenos. The lots in this area, although they are very small, tend to have a more or less regular structure, most of them attached to the wall of the temenos and are thus perpendicular to it. Near the southern wall of the temenos there are large lots (30 metres side), which occupied the open areas along the southern wall of the Roman temple enclosure. 30To the north of the Great Mosque, the presence of another curvilinear route‑which avoids the mosque and which is the continuation of al-Amara Street, converging towards an-Natta Street‑borders the north-eastern quadrant of the temenos, which, in the Middle Ages, was filled with regular lots of courtyard houses of 13 meters side (many of which were recasted into larger lots) set at right angles to the sides of the fence (fig. 4). 31To the south of the Great Mosque, other structures can give us information about the transformation of the pre-Islamic city into the Medieval and later Ottoman city. These are the clusters between M. Assaghh Street to the east, as-Sudiyé Street to the north, al-Mutwalli Street to the west and Medhat Pasha Street to the south. Although it is difficult to define the structure and use that this area had in ancient times (perhaps the citadel of the pre-Hellenistic city? ), the interpretation of its building fabric suggests what may have been his structure in pre-Medieval times; a large empty area, perhaps the parade ground of the Byzantine city. This is proved by the existence of a diagonal path (Bahrat al-Asadiye) that crosses this square area of 140 meters from the side (dimension which corresponds to a square of 480 Roman feet from the side, and then to 4 heredia) at 45 degrees. The orientation of these building fabrics differs from those of the temenos of the temple of Jupiter Damascenus and from that of the Roman colonnaded street18 (Medhat Pacha Street), proving the formation of these fabrics in Medieval times. The Ottoman building fabric that today shapes this area was formed when the use of this square was divested. It started taking shape by the customary diagonal crossing (along the nowadays Bahrat al-Asadiye, on which stand smaller courtyard buildings) of this empty enclosure. The northern quadrant of this area is occupied by courtyard buildings that follow the orientation of the fence, while in the southern quadrant, commercial buildings are set that, given their proximity to the major trade route in the city (Medhat Pacha Street), were formed within it. 19 See Wulzinger & Watzinger 1921. 20 See Sauvaget 1934; Sauvaget 1949; Elisséeff 1980. 32Immediately to the south of this area, the presence of a curvilinear path that starts and converges to the Straight Street, identifies, for an extension of about 100 meters in diameter, a range of buildings radially rotated. It could be, as in the hypothesis of C. Watzinger and K. Wulzinger, an odeon,19 or perhaps a tell, as suggested by J. Sauvaget.20 Given the continuity of this route with the diagonal of Bahrat al-Asadiye it is possible that it was an oval square, a quite common structure in the Roman-Byzantine cities in the region.21 In this case, however, its location would rather be unusual compared to the course of the Straight Street (fig. 5-5bis). 33In two other areas of the intramural city the presence of urban fabrics with radial pattern, denoting their formation on ancient public buildings of the pre-Islamic world can be found. 22 See Sauvaget 1934; Sauvaget 1949; Elisséeff 1980; Wulzinger & Watzinger 1921. 35The process of squatting and reuse of major public buildings of the Roman world and their transformation in the aggregates of courtyard houses has been fairly widespread in Medieval Europe (significant are the examples of Lucca in Italy or Arles and Nîmes in France) (fig. 7). We can probably suppose that even in Damascus‑in a phase characterized by the loss of control over the city by a strong central power and by the need for building areas within the boundaries of the walled city - has made it necessary to use a large empty enclosure as a buildable area. 25 See Cataldi, Iacono, Merlo 2000. 37In Damascus, the two stages of this planning activity are quite evident. 38The first is legible in the different structures and orientations of the aggregates along M. al-Khatib Street, al-Yaghoushiyya Street, al-Khudeiriyè Street, al-Khanji Street and in the far western aggregates to the south of the Straight Street (in the Shagour district). It is interesting to notice how this same rotation of the urban fabric is observed in the aggregates of the Bab al-Bareed district, and, in particular, quite far from this area, in some aggregates of the northern districts of Qaimariyya and Jora, between the walls of the temenos of the Roman temple, and in the area of the assumed amphitheater. The orientation of these clusters is roughly parallel to the course of the Baradā River to the north of the city, perhaps to demonstrate the presence of a Roman-Byzantine land subdivision along the river, which, in Medieval times, was incorporated in the urban fabric (fig. 8). 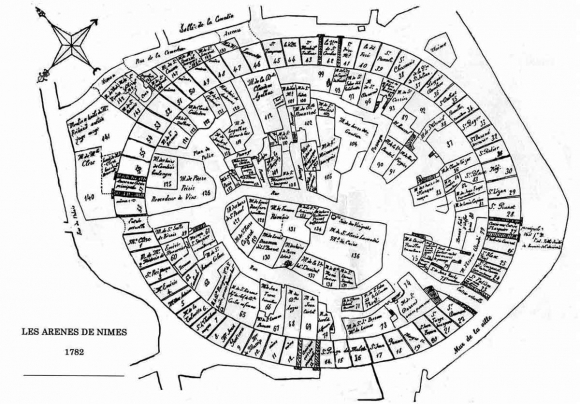 39The second stage can be observed in the urban fabric on a street of the Shagour district, no longer existing but still present in the French cadastral maps, which connects the Straight Street to the Souk al-Hamidiyya. This orientation was also used in a stretch of the northern wall of the citadel, as well as in the aggregates at the south of the Yahood district, along Tallet al-Hijara Street. It is also present outside the walled city, along Bab al-Jabiyé Street and the streets orthogonal to it. It is clear, given the orthogonality of this path with the stretch of the city walls to the north and south of the Bab al-Jabiyé, that it can not be a random orientation of the urban fabric but, most probably a case of the permanence of the traces of routes planned in Roman-Byzantine times and then absorbed into the logic of development of the Medieval and Ottoman city (fig. 9). 40From this interpretation of the formative processes that shaped the urban fabric of the intramural city emerges that Ottoman Damascus derived directly from a process of “specialization” of the Medieval urban fabric.27 Indeed, if the structure of its urban fabric was already formed, almost in its entirety, at the end of the Middle Ages, it is during the Ottoman period that the city took its final form. This was due to a profound architectural transformation which came about in continuity with the formation logic of pre-existing urban fabric. 28 For these topics, which are not the subject of our discussion, see: Atassi 2000. 42At the level of urban fabric, that is one of the interests of this paper, the process of urban specialization has been essentially focused on the recasting of the Medieval lots, for the building of the great monumental complexes.29 If in a first phase, this process mainly regarded the aggregates close to the city’s main public areas (between the Great Mosque and the Straight Street). In a second phase it concerned the eastern areas of the city and the residential buildings. 43The reading of some sample areas allows us to make some considerations on the Ottoman specializations of urban fabric. The first case is given by the reading of the aggregates around the Great Mosque, which allows us to discuss on the formation of the Ottoman layout in the area between Souk Assagha, Nour ed-Din ash-Shahid Street and as-Suleymaniyé Street. Here there is the presence of buildings of 30-40 meters from the side Khan al-Saih Qatana, Khan al-Haramain, Khan al-Gumrik, Khan al-Zafaranjiye, Khan al-Harir, and Khan al-Tutun), which occupied and recasted the large plots that were formed in Medieval times in the open areas outside and inside the western and the southern walls of the Roman temple enclosure. This was done in two different ways. To the east of the Souk al-Khaiyatin, which is the continuation of Nour and Din ash-Shahid, lie Khan al-Haramayn (1630), Khan al-Harir (1573) and Khan al-Tutun (18th century) that are smaller and less regular in shape. That’s because they occupied an area closer to the Great Mosque, which was already densely built in the Middle Ages. It is not a coincidence, indeed, that Khan al-Harir is larger and more regular because it is the oldest and set at the temenos corner. Khan al-Saih Qatana (18th-19th centuries), Khan al-Gumrik (1608) and Khan al-Zafaranjiye (19th century) are larger and more regular than Khan al-Haramayn, Khan al-Harir and Khan al-Tutun because they were built outside the temenos, in a less clogged area. They occupy the entire width of the block reaching a size of about 40 meters. The construction of these buildings (inside and outside the temenos), which took place within a time frame ranging from the sixteenth to nineteenth century, led to the current architectural form of the Souk al-Khaiyatin. 44A second case of transformation performed in the Ottoman period is given by the specialization of the aggregates set to the south of the Great Mosque. 45In this area the Azem Palace was built in 1749-52. It was formed by the recasting of plots that, on the south, are orthogonal to the outer edge of the temenos and, to the north, are set along the route that connects Souk Assagha to M. Assaghh Street. The subsequent acquisition by the Azem family of these plots of different orientation and origin (smaller and irregular the ones to the north, larger and more regular the ones to the south) and their recasting determined the actual structure of the Ottoman palace. 46Another case is represented by the process of specialization of the Roman blocks in the area to the north of Straight Street and to the south of the temenos, which were built to enlarge the Roman-Hellenistic-Nabataean city. Between the 16th and 18th Century, the aggregates in this area underwent an extensive recasting, which led to the establishment of commercial buildings that occupied either the entire width of the blocks (such as the Khan Assad Pasha) or part of it (as in the case of Khan al-Ruzza, Khan al-Sawaf, Khan al-Amud, Khan al-Fuqani, and Khan Suleiman Pasha), but which didn’t change their key structure. In this phase, the construction of public buildings in Qaimariyya and Yahood neighborhoods‑albeit it led to the recasting of plots‑did not alter the structure of the blocks. The construction of these khans led to the current architectural form of Souk al-Bazuriye, which seems to be more recent than the Souk al-Khaiyatin. 47At a later stage, recasting processes also affected the aggregates of the Christian quarters of Bab Touma, especially in the vicinity of Bab Touma Street. Here, the larger plots were set inside the blocks along Bab Touma Street, the “overturning axis” of the Roman city and of connection between the Nabataean and Hellenistic city, where we can find large courtyard buildings such as the Franciscan Monastery, the Lazariste Monastery and the Convent of Charity. In this area of the old city we can also say that, despite the construction of large buildings for Christian worship, the structure of the Ottoman town has not substantially altered the structure of the Nabataean-Medieval settlement and developed in continuity with it. 48From this description and analysis of the characteristics of the Damascene urban fabric through time, emerges that the best term to define the process of formation of its Ottoman aggregates of housing and public or religious buildings is the word continuity: the continuity of the transformations of the pre-Islamic into the Ottoman city. Indeed, the apparent complexity of many of its aggregates is based on the use and on the different Ottoman interpretation of the Medieval underlying structures: building fabrics planned with different modules and orientations, large public or religious building complexes, territorial structures. 49The various orientations, layouts, modules and characteristics of the different structures at the base of the formation of the Ottoman Damascus urban fabric has determined its apparent complexity, which was seen as chaotic from the Orientalists approaches. By a structural reading of its formative and aggregative features, this complexity of the Ottoman urban layout may be subdivided into homogeneous areas and shapes, and into simple forms and structures. Atassi, Sarab, 2000: “Von den Umayyaden zu den Mamluken: Aspekte staedtischer Entwicklung in Damaskus”, in Mamoun Fansa, Heinz Gaube, Jens Windelber (eds. ), Damaskus – Aleppo. 5000 Jahre Stadtentwicklung in Syrien, Mainz Am Rhein, Verlag Philipp Von Zabern, p. 108-123. 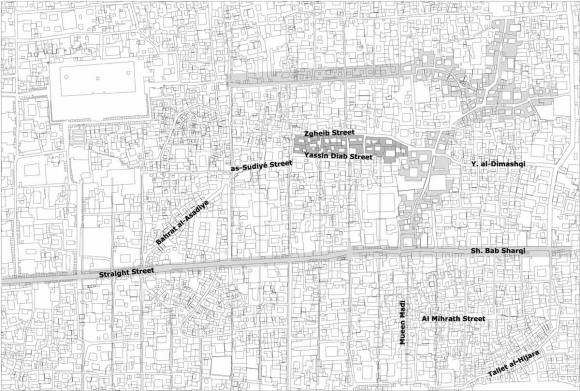 Behrens Abouseif, Doris, 1993: “Alternatives to cadaster maps for the study of Islamic cities”, Environmental Design 1-2, p. 92-95. Caniggia, Gianfranco, 1963: Lettura di una città, Como, Roma, New Press. Caniggia, Gianfranco, 1976: Strutture dello spazio antropico, Firenze, Alinea. Caniggia, Gianfranco & Maffei, Gian Luigi, 2001: Architectural composition and building typology. Interpreting Basic Building, Firenze, Alinea. Cataldi, Giancarlo, Iacono, Patrizia, Merlo, Alessandro, 2000: “La geometria di Firenze il progetto matrice della città e del territorio”, Firenze Architettura 1, p. 4-17. Elisséeff, Nikita, 1980: “Damas à la lumière des théories de Jean Sauvaget”, in Robert B. Serjeant (ed. ), The Islamic City, Paris, UNESCO, p. 157-177. Fansa, Mamoun & Gaube, Heinz, Windelberg, Jens (ed. ), 2000: Damaskus – Aleppo. 5000 Jahre Stadtentwicklung in Syrien, Mainz Am Rhein, Verlag Philipp Von Zabern, p. 108-123. Jones, A. H. M., 1971: Cities of the Eastern Roman Provinces, Oxford, Clarendon Press. Levi, Mario Attilio, 1989: La città antica, Siria e Palestina, Roma, L’Erma di Bretschneider. Maffei, Gian Luigi and Maffei, Mattia, 2011: Lettura dell’edilizia speciale, Firenze, Alinea. Neglia, Giulia Annalinda, 2009: Aleppo. Processes of formation of the Medieval Islamic City, Bari, Poliba Press. Neglia, Giulia Annalinda, 2009, Medina. Essays on the Urban Landscapes of South-Eastern Mediterranean Cities, Bari, PolibaPress. Pascual, Jean-Paul, 2000: “Damaskus in osmanicher Zeit”, in Mamoun Fansa, Heinz Gaube, Jens Windelber (eds. ), Damaskus – Aleppo. 5000 Jahre Stadtentwicklung in Syrien, Mainz Am Rhein, Verlag Philipp Von Zabern, p. 135-147. Pascual, Jean-Paul, 2000: “Die Suqs von Damaskus”, in Mamoun Fansa, Heinz Gaube, Jens Windelber (eds. ), Damaskus – Aleppo. 5000 Jahre Stadtentwicklung in Syrien, Mainz Am Rhein, Verlag Philipp Von Zabern, p. 290-297. Petruccioli, Attilio, 2002: “La permanenza della città classica nei tessuti arabi del Mediterraneo”, in Mustapha Khanoussi, Paola Ruggeri, Cinzia Vismara (eds. ), L’africa romana. Lo spazio marittimo del Mediterraneo occidentale: geografi a storica ed economica, Roma, Carocci, 3, p. 2267-2278. Petruccioli, Attilio, 2002: “New Methods of Reading the Urban Fabric of the Islamicized Mediterranean”, Built Environment 28/3, p. 202-216. Petruccioli, Attilio, 2007: After Amnesia: Learning from the Islamic Mediterranean Fabric, Bari, ICAR. Sack, Dorothée, 1985: “Damaskus die Stadt intra muros”, Damaszener Mitteilungen 2. Sack, Dorothée, 1989: Damascus: Entwicklung und Struktur einer orientalisch-islamischen Stadt, Mainz Am Rhein, Verlag Philipp Von Zabern (Damaszener Forschungen 1). Sauvaget, Jean, 1934: “Esquisse d’une histoire de la ville de Damas”, Revue des études islamiques 8, p. 421-480. Sauvaget, Jean, 1949: “Le plan antique de Damas”, Syria 26, p. 314-358. Watzinger, Carl & Wulzinger, Karl, 1921: Damaskus: Die antike Stadt, Berlin, Vereinigung Wissenschaftlicher Verleger Walter De Gruyter & Co.
Weber, Stefan, 2007: “Changing cultural references: Architecture of Damascus in the Ottoman period (1516-1918)” in Maurice Cerasi, Attillio Petruccioli, Adriano Sarro, Stefan Weber (ed. ), Multicultural Urban Fabric and Types in the South and Eastern Mediterranean, Beirut, Ergon Verlag, p. 189-224. Wirth, Eugen, 2000: Das Orientalisches Stadt im islamischen Vorderasien und Syrien, Mainz Am Rhein, Verlag Philipp Von Zabern. 1 The writing of this article could not have been possible without the cartographic support of the digitization of French cadastral maps of the ancient city of Damascus kindly provided to me by The Directorate of the Old City of Damascus, and in particular by Maktab ʿAnbar. I’m also very grateful to Dr. Kamal Bitar from the Aleppo GTZ to get me in touch with the staff of The Directorate of the Old City of Damascus. Crucial support for this reading was also represented by the French cadastral maps at the scale of 1:500, kindly provided to me by the Ifpo staff, and in particular by Mrs Sarab Atassi. Finally, the intellectual debt goes to prof. Attilio Petruccioli for continuous debate on the issues of the formative processes of the Ottoman Damascus urban fabric, some of which insights had already been published in his book After Amnesia: Learning from the Islamic Mediterranean Fabric (Petruccioli 2007). 2 See Sack 1985; Sack 1989; Sauvaget 1934; Sauvaget 1949; Elisséeff, 1980; Wulzinger & Watzinger 1921. 3 See Caniggia 1963; Caniggia 1976; Caniggia & Maffei 2001; Neglia 2009a; Petruccioli 2002a; Petruccioli 2002b; Petruccioli 2007. 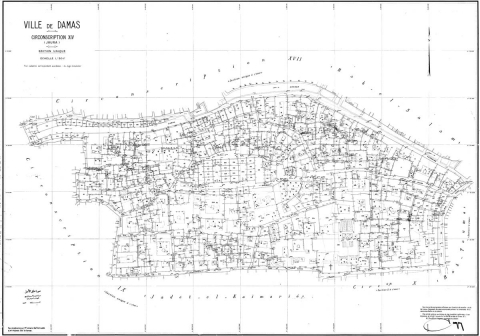 6 The vectorization of French cadastral maps of the ancient city of Damascus has been made by the team of architects and engineers working at the Directorate of the Old City of Damascus in the Rehabilitation of the Old Damascus Program. 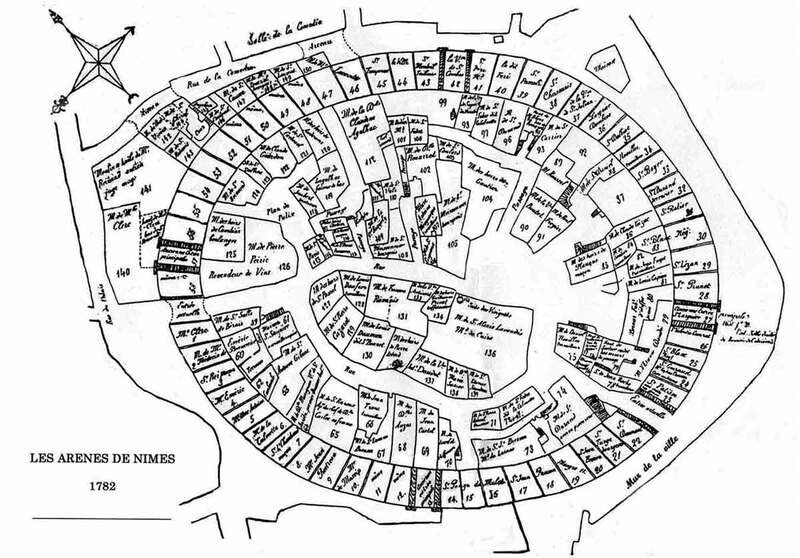 9 Jean Sauvaget argues that in the city of Damascus, in the Roman times, there was only one colonnaded street and not two, as claimed by Wulzinger & Watzinger, and that the division into blocks they proposed is only theoretical because it is not based on evidence given by the land registry. Moreover, in contrast with the view of Carl Watzinger and Karl Wulzinger, supporting the existence of two theaters, Jean Sauvaget ascribes the existence of only one of them, with a diameter of around 100 meters, claiming that the other semi-circular shape, which can be read on the land registry of the ancient city, can depend only on the orography. Sauvaget also suggests the existence of a tell of two hundred meters in diameter, at the center of the south side of the agora. See Wulzinger & Watzinger 1921; Sauvaget 1934; Sauvaget 1949. 10 The size of the colonnaded street was deduced by Jean Sauvaget by the width of the arches of the Eastern Gate—which is at its end—and that was not displaced by Medieval remodelings of the city. 500 meters far from the East Gate there are the remains of a monumental Roman arch, which acts as a hinge between two rotated segments of the Via Recta. In addition, the Western Gate of the city was not on the extended line connecting the eastern gateway to this arc. See Sauvaget 1934; Sauvaget 1949; Élisséeff 1980. 13 The translitteration of arabic toponyms used in this article has, due to practical reasons, been adapted to that used on the cadastral maps. 14 The “medievalization process” is a process of spontaneous transformation and recasting or subdivision of the urban fabric and building plots. It often occurs by occupying the open and public areas of the city. For further information about the topic, see Caniggia & Maffei 2001; Petruccioli 2007. 15 A “planned building route” is a route “orthogonal to the matrix route when it is started to devote to building activity the borders of the latter. To optimize land use the distance between a planned building route and the following one corresponds to back-to-back arrangement of the building lots.” See Caniggia & Maffei 2001. 18 Under the Romans, the via recta of Seleucid settlement was transformed into the colonnaded street. It was a meeting place for exchange and trade, and replaced the agora, the stoa, the forum and the basilica in the exercise of these functions. Its monumental aspect was accentuated by the presence of tetrapyla and triumphal arches situated at significant points. See Jones 1971; Levi 1989. 21 As in the cases of Jerusalem and Jerash, it may have been an oval square. Indeed, in Syrian Roman cities, the functions carried out in the public piazze, which were often oval, were rarely the same as those in the agora. The piazze were often simply monumental solutions to problems of urban embellishment and marked the end or intersection of streets. See Jones 1971; Levi 1989. 23 The different location of the theatres in the urban fabric with respect to other cities of the Roman Empire was probably dependent on the influence of local traditions. See Jones 1971; Levi 1989. 24 While in the Hellenistic period the most common public buildings in Syrian cities were the agora, the theatre, the gymnasium and the temple, in the Roman period they were the hippodrome, the forum, the basilica, the temple (often situated within the specific urban areas of the sanctuary or the acropolis), gardens, baths and theatres. Amphitheaters were rare and placed in cities where there were legionaries. See Jones 1971; Levi 1989. 27 The “specialization process” is a process of turning of basic (residential) building into public (not residential). For further information about the topic, see maffei & maffei 2011. 29 References for the formation of the urban fabric of the Ottoman Damascus are: Pascual 2000a; Pascual 2000b; Weber 2007. Giulia Annalinda Neglia, « Processes of Formation of Ottoman Damascus », Bulletin d’études orientales, Tome LXI | 2012, 223-242.